Thank you for your interest in joining or renewing your membership to FMEA, NAfME, and Component Associations. 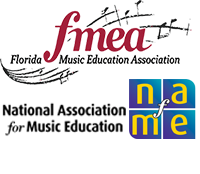 Active membership in the Florida Music Education Association shall be granted to individuals engaged in the teaching, supervision, or administration of music in elementary and secondary schools, colleges or universities within the state. Active membership shall grant participation in the activities of the FMEA including the right to vote upon business matters before the Association and to hold office. Active members shall be admitted to state, division and national meetings upon compliance with registration requirements. All membership applications and renewals must be done with this on-line application. At the end of the on-line process here, you will have the opportunity to pay instantly with a credit card or print an invoice to mail in along with a check. Membership and renewals are non-refundable. Please confirm the proper method of payment with your school or district before proceeding. The following information is for your information only, and not an invoice. To complete the membership process, you must click the button above and then follow the instructions to either pay online or print an invoice to send along with a check. Do not send us a check without an invoice generated by clicking the above button. Full Active Member $150.00 For individuals currently teaching, supervising, or administrating in elementary schools, secondary schools, colleges, or universities. Retired Member $82.00 For those who have retired from the teaching, supervision, or administration of music in K-12 schools or higher education. Active NAfME Life Member $51.00 NAfME (MENC) Life Members who are still teaching. You must have purchased a life membership through the NAfME office before selecting this option! Retired NAfME Life Member $32.00 NAfME Life Members who are retired. You must have purchased a life membership through the NAfME office before selecting this option. Collegiate Student Membership $58.00 Florida Collegiate NAfME: the membership organization for future music educators, to improve opportunities and experiences for college students before they become practicing music educators. Introductory Membership $87.00 This is for First-Year Teachers only. Only select this option if you are currently in your first year of teaching. The membership organization for band directors; chief purpose is to promote, expand, and improve the band programs in Florida schools, and provide professional growth for band directors. The membership organization for orchestra and string educators; programs and activities for orchestras and string programs; provides for professional development of its members. The membership organization for vocal music; the chief purpose is to promote and develop interest in vocal and general music, and the continued improvement of school choral groups in Florida’s secondary schools; professional development of choral directors. The membership organization for elementary music educators; chief purpose is to unite and strengthen the professional standing of all elementary music teachers in order to encourage more effective teaching of music. The membership organization for college music educators; chief purpose is to address the concerns unique to music programs in colleges, universities, and community colleges. The membership organization for music supervisors; deals with curriculum standards, facilities, and programs from the perspective of county level administrators.